Sparkhouse Spotlights Denso's "Ruggedness and Intelligence"
Sparkhouse just completed a new project for DENSO Heavy Duty, a global OE manufacturer with five decades of experience perfecting technology and processes that give customers an edge on the road. IMW Agency chose the Orange County video production team to create an online marketing video to help launch their new line of technologically advanced alternators, the PowerEdge™ High-Amp Alternator series. A major player headquartered in Japan, DENSO Corp. specializes in advanced systems and technology and is the largest manufacturer of alternators in the world. The PowerEdge series of Alternators offer the most efficiency available from any manufacturer, so the goal of the spot was to debut the innovative design concept and spotlight the exclusive benefits of durability, longer battery life, fuel economy, and ultimately, lower operating costs for commercial fleets. Sparkhouse partnered with Southern California ad pros IMW Agency for the project, filming overnight on location at the Inland Kenworth dealership in Carson, California. The team was comprised of a talented crew, including director Alex Meader, director of photography Connor Hair and Sparkhouse CEO Torrey Tayenaka as creative producer. To achieve the cinematic and fluid look the team was aiming for, the location filming was done with a Technocrane to capture the branding elements and cutting-edge appeal of the new line. Sparkhouse also brought in Southern California design agency Related Grey to add sleek graphics and animation, and the finished piece featured music from musician and sound designer Stefan Macarewich and the editing skills of David M. Helman. 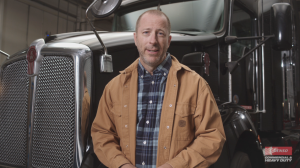 “With this project we really wanted to blend the feeling of ruggedness and durability that comes to mind with commercial trucks and diesel engines with a sense of sleekness and intelligence that would reflect the elegant engineering of the Power Edge series,” says director Alex Meader.